Isaac Levitan’s art represented the culmination of Russian Landscape painting of the 19th century. His paintings go beyond depicting objective representations of nature; they are suffused with profound philosophical and social significance. Isaac Levitan was born in 1860 in Kybartai, Russia (now Lithuania). His father moved the family to Moscow in the early 1870’s to seek greater fame and fortune. Isaacs’s mother and father died while he was attending the Moscow College of Painting. Only seventeen, Levitan became homeless. He stayed with friends and family and even slept in the empty classrooms of the college. His tuition was waived because of undue hardship. Isaac’s teachers, Vasily Polenov and Alexei Sarasov, stressed the importance of working outdoors. 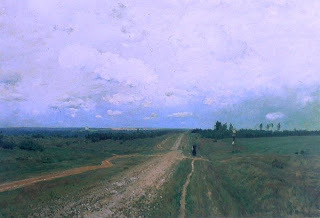 Sarasov taught his students to “seek out in the most ordinary and commonplace phenomena the intimate, the infinitely touching and often melancholy features which are strongly felt in our native scenery and which evoke an overwhelming response in our soul.” This was a philosophy that the young Levitan would adopt in his own painting. It was his ability to evoke the subtlest emotions in his landscapes that helped Levitan to convey the Russian landscape as no one else did. He is often associated with Russian Impressionism. 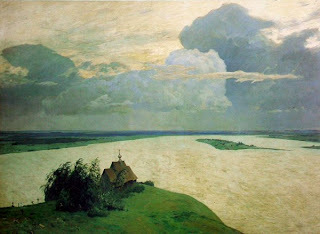 Although he painted in an Impressionist manner, Levitan cannot be defined by this technique alone. It is this aspect that elevates his art from French Impressionism. The French school sought only to convey the fleeting effects of light and contemporary life without any deeper meaning. Isaac Levitan was a friend of the writer, Anton Chekhov. Both men shared and nurtured a common view of nature and mankind’s place in it. They both used nature as a metaphor for human emotions in their art. It is an art of the psychological landscape; the landscape of mood and it has influenced generations of artists that have followed him. In 1897, Levitan was diagnosed with a heart condition. Three years later, he died at the young age of forty.